For any New Yorker who loves Viennese Waltz and Viennese culture, The New Opera Ball is a place to experience the most authentic representation of both without going to an airport. An 18-person orchestra was flown in from Vienna to play at the event. The choreographer from the Vienna State Opera came to New York to conduct the rehearsals for the opening ceremony. The authentic Austrian food was prepared by the chef that cooks for the Austrian Olympic Team. 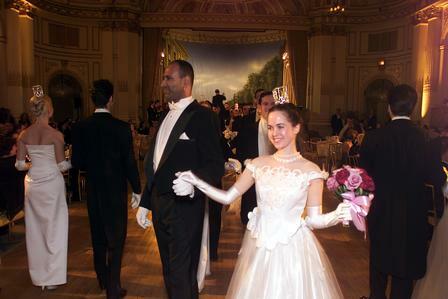 The ball featured the performances of famous Viennese opera singers. The New Opera Ball in New York is the only event that is officially endorsed by the Vienna Opera Ball in Austria, which may very well be the most famous society ball in the world. The New Opera Ball took place at the Grand Ballroom of The Plaza Hotel, which is a common venue for society balls held in New York City. My friend Kerrie and I were among the 20 couples who took part in the ball's opening ceremony during which we performed a vintage court dance followed by the traditional Viennese Waltz. We attended the four two-hour rehearsals held at The Plaza on Monday through Thursday evenings. The rehearsals where directed by Alexander Hysek - the Master of Ceremonies of the original Vienna Opera Ball. He came to New York from Austria specifically to conduct the rehearsals. On Friday - the night of the ball - we had the dress rehearsal. Men were dressed in tails and women were wearing the debutante snow-white gowns. In the choreography there was one move which was called "Careful Crown". In that move the gentleman's hand went over the lady's head and we had to be careful not to knock the crowns that the ladies were wearing. There were hair dressers on sight to take care of women's hair and attach the crowns. However, to take the crowns off at the end of the ball was women's own responsibility. After the dinner was finished, the opening ceremony began. The white grand piano that was used for the live background music during the dinner was rolled away from the middle of the dance floor and the members of The Vienna Opera Ball Orchestra entered the stage. They played the sounds of a fanfare and the ball's Master of Ceremonies Alexander Hysek made a short introductory speech sounding very similarly to Arnold Schwarzenegger. After the orchestra played the American and Austrian national anthems, the 20 debutante couples proceeded to walk out to the middle of the dance floor one behind the other to the sounds of a Polonaise played by the orchestra. Kerrie and I were number three in line. The first two couples where from Austria who flew in early to assist with the rehearsals. We were faced by hundreds of ball attendees as well as dozens of cameras in their hands and in the hands of many photographers who were right next to the stage probably blocking the view of the people sitting at the nearby tables. At the end of the procession we congregated at the base of the stage making room for the Austrian opera singers to perform two songs. The first singer was Marcela Cerno performing Frühlingsstimmenwalzer, op. 410 by Johann Strauß Jr. She was followed by Adrianne Pieczonka and Joachim Moser performing Lippen schweigen by Franz Lehár. After the singers were finished, we walked back out on the dance floor two couples in a row to form the formation for our main dance number - a vintage European court style dance performed in synch by all couples. Following the court dance the music changed to Strauss' Blue Danube and we embarked on the twirling journey around the dancefloor dancing the Viennese Waltz as the audience burst with applause. After our Walz performance, the Master of Ceremonies called "Alles Walzer" (everybody waltz) and in a matter of minutes the dancefloor was filled to the max by the people from the audience joining the debutante couples. At this point the Waltz changed into something that resembles the New York City subway during the rush hour. Dancing in the Grand Ballroom continued past midnight. At some point the Vienna Opera Orchestra was replaced by a smaller band playing a variety of ballroom dance music. After midnight the Baroque Rooom located next to the Grand Ballroom was opened. It resembled a night-club disco with light effects and a DJ playing a good mix of contemporary dance music to which the ball patrons got a chance to shake their booty free-style while still wearing their tuxedoes and ball gowns. I did not miss a chance to show off with some nice hustle dancing. Those of us who got too exhausted from all the dancing could replentish our energy with the food served at the "Midnight Buffet" The food featured authentic Austrian frankfurters and some other dish who's name I forgot. Also ther were many differnet kinds of deserts available. The ball continued until 4AM. After around 11 PM the dancefloor in the Grand Ballroom was not that crowded so there was plenty of room to dance. It was one of the most fun balls I've been to.